After seeing Four Sigmatic on a few fitness friend's Instagram accounts, I became curious about this brand as I have a major addiction to coffee. It's likely my ONE nutritional downfall that's pretty serious. After being shroom-curious, Chef Court started drinking it in hopes to avoid the crash of coffee, as well as obtain the amazing benefits of these shroomy-super foods. As we grow our relationship with these unique flavors, we couldn't be happier with the taste and benefits thus far. Check out our Instagram & blog for updates on recipes, giveaways, and discounts! Be sure to click the red link to the get on our level, ie; #onshrooms. It has been four years that I have been a subscriber to FMTV.COM after being given this gift of knowledge after facing an array of health battles. 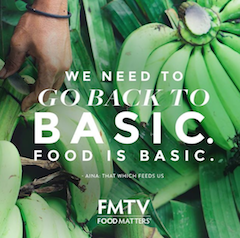 Knowing that I needed to connect with the food system on a deeper level, FMTV.COM has helped to bridge the gap of what the media outlines, and the reality behind the engine of our agriculture & manufacturing system. FMTV has helped to guide, educate, and bring awareness to my life when it comes to the food industry. Although they have a great deal of resources relating to health, wellness, spirituality, fitness, and wellbeing, I have utilized FMTV.COM as my resource to watch food-related documentaries, something that I "nerd-out" to on a weekly basis. I have never valued a website as much as I value FMTV.COM! Click the link to the left to make food truly matter to you! Tree Tribe is a community driven outdoor lifestyle brand that plants 10 trees on every sale. We value their dedication to our environment & nature, adventure, travel & community which are their core values. We support brands that help to make our world a better place. Click this link to purchase goods & plant trees! Macro Bars are my favorite go-to bars to keep me fueled up while cooking for a client or doing more labor intensive activities. They’re heavily nut-baseed and make for a delicious snack (and often in a rush) snack to throw into your purse as an emergency. Use my code “SHAREFIRST15” with this link.